Genuine OEM Xerox Toner Cartridge, Cyan, High Capacity 6,000 page yield. Xerox part number: 113R00723. Color Laser Toner Cartridge compatible with Xerox Phaser 6180. Remanufactured Xerox Toner Cartridge, Cyan, High Capacity 6,000 page yield. Replaces Xerox part number: 113R00723, 113R00719. Color Laser Toner Cartridge compatible with Xerox Phaser 6180. Remanufactured Xerox Toner Cartridge, Magenta, High Capacity 6,000 page yield. Replaces Xerox part number: 113R00724, 113R00720. Color Laser Toner Cartridge compatible with Xerox Phaser 6180. Remanufactured Xerox Toner Cartridge, Yellow, High Capacity 6,000 page yield. Replaces Xerox part number: 113R00725, 113R00721. Color Laser Toner Cartridge compatible with Xerox Phaser 6180. Remanufactured Xerox Toner Cartridge, Black, High Capacity 8,000 page yield. Replaces Xerox part number: 113R00726, 113R00722. 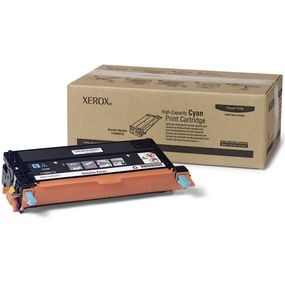 Laser Toner Cartridge compatible with Xerox Phaser 6180.